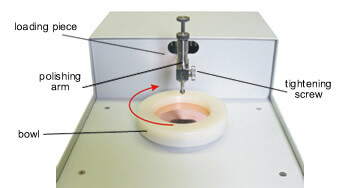 For fast, high-speed grinding of small samples from 20 to 50 mm (¾" to 2"). The unit comes with a stainless steel or hard-faced blade which rotates at speeds up to 12,000 rpm and will successfully grind bauxite, bone, ceramics, coal, Devorda's alloy, fertilizer, filter paper, fly ash, frozen tissue, glass, grain, kaolinites, leaves, limestone, muscle tissue, pharmaceuticals, pigment blends, plastics, rocks, roots, seeds, slags, soil, teeth, wood, etc. The grinding chamber measures 2⅛"dia. x 1" deep (54 x 25 mm). Its overall dimensions are 5½" x 7" x 11" (H) (14 x 18 x 28 cm). It comes with a 6 FT. (1.8m) 3-wire cord and grounded plug. Power: 115V, 60Hz or 220V, 60Hz. The grinder operates only when the cover is latched and in place. This provides safety and prevents sample loss. The temperature of the grinding chamber can be maintained by means of built-in heat exchangers. ¼" (6.4mm) tubing connections on the cover and housing accept tubes for circulating water, methanol/dry ice liquid, or liquid nitrogen. The cover, grinding assembly, and milling blade head are removable for easy cleaning. The aluminum housing has an epoxy finish and non-skid rubber feet. The control panel has an overload protection reset button and a pilot light. The 1/5 horsepower (150 watts) motor develops a torque of 30-ounce-inches (2.2 Kg-cm) at 12,000 rpm. 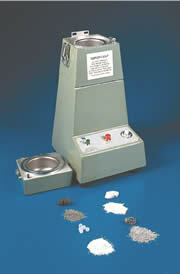 Micro-Mill® 1, with stainless steel blade, 0-5 minutes electrical timer with an ON position for continuous operation. Micro-Mill® 2, with hard, stellate faced blade, with a momentary hold-down switch. In many materials preparation laboratories the need for high specimen throughput and precision made specimen preparation tools is a difficult bottleneck to correct. The Model 195 MultiLap™ is designed to grind and polish multiple specimens with precise control over each individual specimen. The fixture incorporates up to 6 separate pistons which are used for holding the specimen during preparation and controlling the amount of material to be removed. 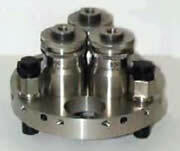 The piston assemblies allow for specimens of up to 1" diameter to be polished in 10-micron increments. The specimen mounts also provide a means for viewing the specimen in transmitted light, enhancing detection of features that require a light transparent specimen.Wear resistant Delrin plastic legs provide support and are very gentle on many types of abrasive films and media. Overall, the Model 195 is a versatile and precise instrument for performing any precision lapping processes and is an excellent addition to any specimen preparation lab. 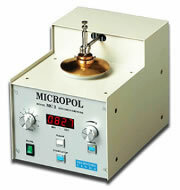 Micropol™ polisher is a compact, versatile, electrically controlled, precise mechanical specimen grinder/polisher designed for planar grinding, dimpling, thinning and polishing of specimens in the fields of nanotechnology, semiconductors and material science. 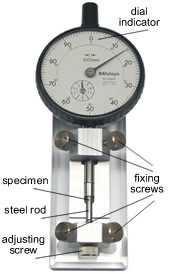 The parameters of polishing (speed, load, time, etc.) can be matched according to the properties of the specimen. High quality samples are prepared with minimal efforts by the operator. While the Micropol™ MC3 is well suited for metallographic polishing, it has been specially designed for precision TEM polishing applications. Two types of specimen holders are provided with each unit that makes it ideal for the preparation of both planar and dimpled samples, respectively. 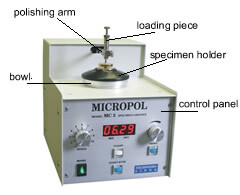 The arm of Micropol™ moves the specimen holder or the specimen itself in a semi-random geometric pattern gently pressing it to the bottom of a bowl containing suitable abrasive material. The abrasive material can be grinding paper or suspensions of polishing compound deposited on polishing cloth. 1. MC-PBC Polishing Bowl "C"
Flat plastic bowl: plastic disc coated with Cu foil on both sides (4 pieces). 2. MC-PBE Polishing Bowl "E"
4 Spherical bowls for dimpling. Locking of the bowl on the bayonet lock. Locking direction indicated by arrow. 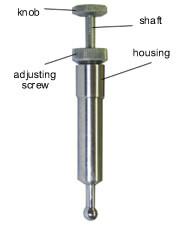 Cross-section showing the sample holder rod and the correct position of the sample.